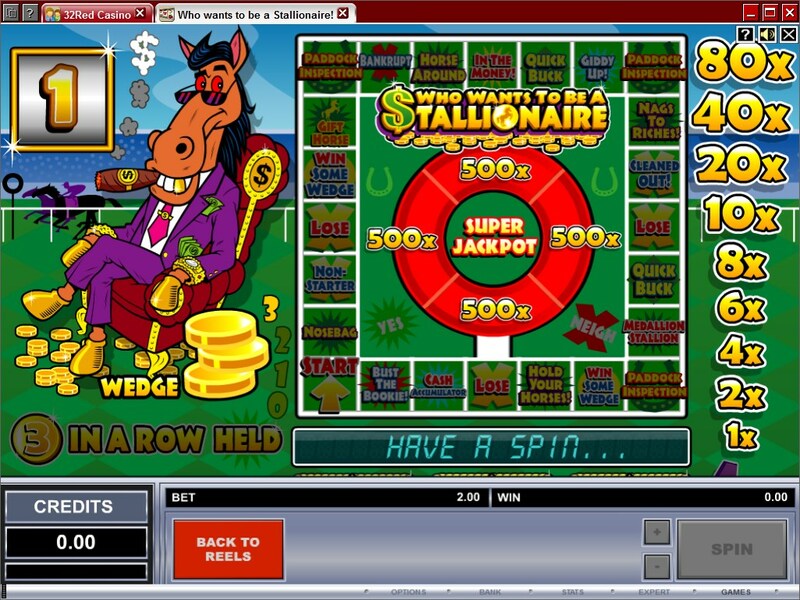 Coming from Microgaming, Who Wants To Be a Stallionaire is a slot machine with a classic influence, but which was done in a way that would make it a favorite for fans of the modern genre as well. The title is a mix between the word Stallion and the game show “Who wants to be a millionaire”. You can see a horse in a suit on the left side during the special feature, smoking a cigar and having gold coins all over the floor. 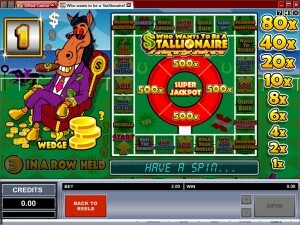 Things like horseshoes and cigars are also part of the main game’s paytable, along with carrots and luxury cars. You will discover a 3 reel classic, with 1 line and with a board game used as its feature, triggering multiple types of bonus features if you’re lucky enough to get inside. Its biggest reward is worth $5,000. Features of Who wants to be a Stallionaire! The game is full of features, but they’re all accessed by getting into the main bonus game. In order to get into this feature, you need to land three horseshoe symbols in any direction, as indicated at the left of the reels. The horseshoes can be made out of bronze, silver or gold. Once you’re in the bonus game, you will see the horse I mentioned to the left of the board game on which you get to play. What you get here depends on your luck. 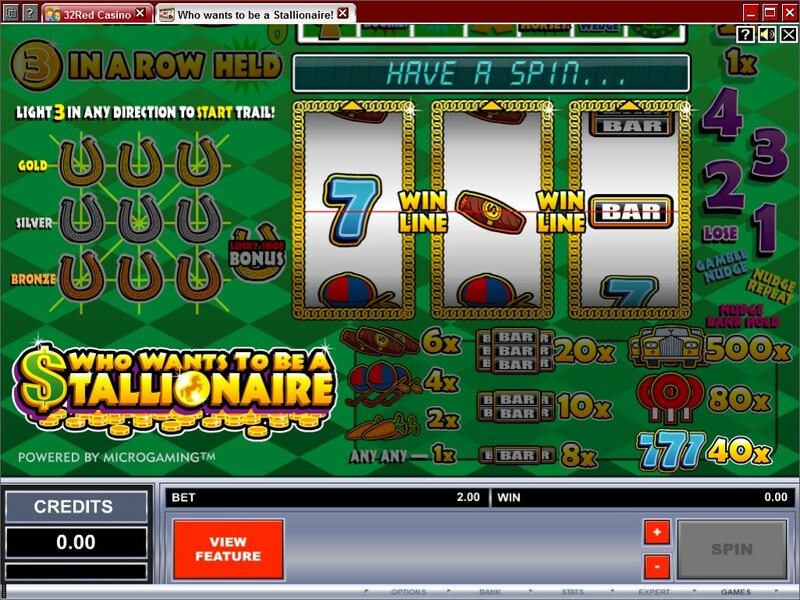 You can get payouts of 1x to 80x, or you could be hitting a 500x prize or the Super Jackpot. You also have Lose spots on which you can land on the board and all sorts of bonus features which you can trigger. These bonus games include titles like Nosebag, Non-Starter, Win Some Wedge, Gift Horse, Paddock Inspection, Horse Around, In The Money, Quick Buck, Giddy Up, Nags to Riches, Medallion Stallion, Hold Your Horses, Cash Accumulator and Bust the Bookie. As you can see, there is no shortage of features to experience if you get into the bonus feature. You’re getting a single coin that you can use to place a wager, and you decide what its value should be. The maximum value is $10, the minimum is $0.01. Whatever value you choose for it, that will be the wager for one spin. Top rewards will give you 500 times the bet back, meaning up to $5,000 in this game. The base game design is not that special, the background image being with a checkered green on it which comes in two tones. Gold is used in a couple of places for decoration purposes, the reels are on the right and the paytable symbols surround it. The bonus feature takes you to a horse racing track. Overall, it’s a better looking slot than a true classic will ever be, but the design style is not as good looking as it would be for a recently released slot machine. Symbols: Horseshoe (bonus), Limousine (500 coins), Paddle (80 coins), Red Seven (40 coins), Three Bars (20 coins), Two Bars (10 coins), Single Bar (8 coins), Cigar (6 coins), Riding Gear (4 coins) and Carrot (2 coins). It’s definitely an unusual game, and I think you could have fun with it, provided that you get the bonus game to activate. Do that, and you will love this game. Who wants to be a Stallionaire! 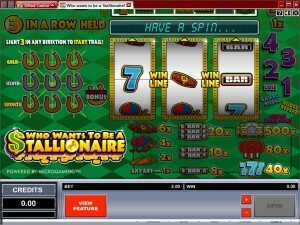 can be found at any Microgaming casino, where you get a chance to play it for real money or in free mode.